The late Sid Lorraine designed several novel paper folding tricks. These papers were folded to reveal various pictures or messages. Most of these were released in the mid-50s. By far, the best was called Chinese Folder. This item has been long forgotten and was discontinued by the Abbott Magic Company more than thirty years ago. Devin Knight has received permission from the company to release this item again and updated the presentation for today's audiences. 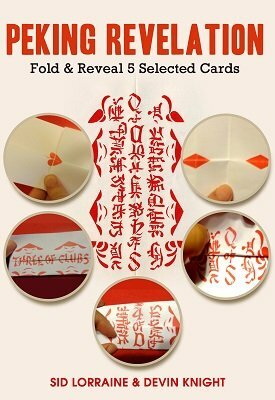 The folding, reversing or covering part of simulated Chinese writing to reveal the name of a selected card is almost as ancient as China itself. However, to the best of our knowledge, this is the first time such a paper has been used to reveal the name of FIVE chosen cards. Multiple card revelations are very popular nowadays, but many of them require a lot of skill to do the revelations. Comedy Peking Revelation allows to you reveal five playing cards with no skill and in a very amusing manner. One person cuts the deck and removes five cards, or five people can each take a card. Regardless, none of these cards are shown to the performer. The performer removes a letter from his pocket written in Chinese. He says this is from his Chinese magician friend, Foo Ling Yoo. The performer says the names of the five selected cards are written in the letter. From that moment on, the laughs come fast and quick with amusing comedy patter that will get laughs from even the most harden audiences. By quickly folding the paper, the performer plainly reveals the names of all five selected cards printed on the paper. Nothing left to the imagination; the cards are plainly visible much to the amazement of the audience. The final revelation is the most amazing of all. PDF comes with a master copy for having copies made at a copy shop. You will have a lifetime supply with the master copy. PDF includes both illustrations and photos showing how the paper is folded to reveal each card. You can have a copy shop enlarge the drawing so this can be used on stage with five spectators, allowing the audience to easily see the card revelations. A big flashy stage effect full of comedy that plays big and packs small. Priced way too low for a trick of this entertainment value.